Pick up a bargain at Salford Quays Designer Outlet Centre, boasting over 80 top brand stores retailing the latest designer names at up to 50% off normal prices! 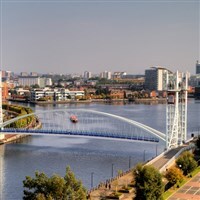 You can also marvel at the Lowry Centre and explore the wonderful Imperial War Museum of the North! One person paddling a canoe seems simple, but up to sixteen people paddling a Dragon Boat together in unison is not so simple, and on occasion, can be hilarious! Each team of 16 rowers will raise at least £100 per person for charity in order to compete for the title of Champions of Salford 2019 so come along and cheer them on in their quest for glory and of course, raise funds for Charity!